AP Motor Store is an excellent responsive shopify theme with a lot of new features and modern ,clean design. It not only provides suitable design for e-commerce sites about motor’s products but also can be easily modified to adapt to Car Salon, Equipment Store, Car Store, Sport Store, Sport Facilities , Clothing Shop and many more. The Shopify theme is powered with AP Shopify Framework , one of the best shopify framework. It is fully responsive, twitter bootstrap 3 and supports both CSS3 and HTML5 that help to create refined web pages with semantic accuracy. On Ap Motor Cycle’s homepage, the first impression is a modern design such as a light background color, a dark header & footer and a top menu & categories column in sidebar, these components make customers comfortable to continue browsing the sites. 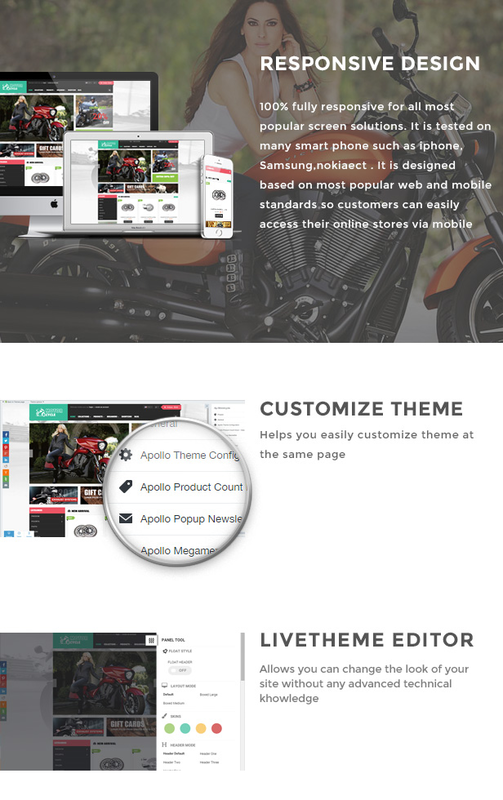 AP Motor Cycle Responsive Theme comes with lots of built-in functionality which includes a powerful admin panel. This panel will help you manage your site better, customizations cannot be easier. If you have been looking for an amazing theme for your online BIKINI shop with SMALL FUND, FREE AP BIKINI shopify theme might certainly be your last searching. It should be emphasized that this theme is available to all visitors as it is totally free. Sexiness, charm and luxury are what this theme brings to your FASHION shop, ACCESSORIES store, COSMETICS store and so many more. This template covers many essential things in order to help you run your own online shop smoothly. It is 100% responsive and highly customizable. No matter which devices your customers use, your site can be displayed visually with a consistent look. FREE AP BIKINI SHOPIFY THEME is built with flexible layout and eye-catchy images that make the first impression of visitors become the lasting impression. Interestingly, each banner is integrated with the most attractive function enhancing visual, namely 2-in-1 banner which includes both product and models. Then, your customers can easily make decision to buy their favorable items. Besides, this FREE SHOPIFY theme is constructed with the most recent applied sciences equivalent to Bootstrap 3, CSS3 and poweredwith many administrative tools such as: powerful admin module, distinctive product labels, quick view, ajax add-to-cart, multi comparison that will make your site have unique and fashionable style in your own ways. Just once, you will love it!